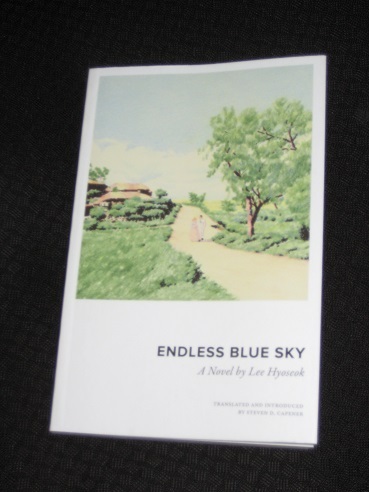 Lee Hyoseok’s Endless Blue Sky (translated by Steven D. Capener, review copy courtesy of the publisher), originally serialised between 1940 and 1941, focuses on Cheon Ilma, a Seoul resident whose life is just starting to look up after some hard times. A man with many connections, he is chosen to travel up to Manchuria (at the time, like Korea, part of the Japanese Empire) to persuade the Harbin Symphony Orchestra to visit Seoul. His trip is a success in more ways than one. The orchestra is happy to agree to the concerts, and a lottery ticket he buys on a whim is a winner – it’s all coming up roses for Ilma. It’s his relationship with the beautiful Russian dancer Nadia, though, that really makes his trip worthwhile. Having come close on previous visits, this time the couple finally get together, and it isn’t long before they make the long journey back to Seoul to begin a new life together. However, there are a few dark clouds hovering in the blue sky of Ilma’s happiness. You see, he has a history with the ladies, and two of his old flames haven’t quite given up on him. Having settled down with Nadia, you wonder whether he’ll be able to resist the temptation provided by his former loves. Endless Blue Sky was originally serialised in a newspaper, and there are a few hints of the usual drawbacks of this style of publication, such as a little repetition, the occasional jump in the action and a rather rushed ending. However, overall Lee’s novel is an entertaining look at life in the late colonial era, with a focus on a cast of slightly more successful characters than is often the case. This isn’t a tale of poor souls scraping a living, but of bored people battling through relationship issues and existential ennui. The focal point of the action is Ilma, a charming fellow who attracts women without really trying. Quite apart from Nadia, there’s Danyeong, a vampish actress who has been pursuing him for quite a while, and Miryeo, the woman who rejected him years ago and now regrets it. The second half of the book plays with the idea of the women revolving around Ilma and coming into contact with each other, forming a series of awkward relationships that could collapse at any moment. In this sense, much of the novel plays out as a fairly claustrophobic story where the reader is kept guessing as to which way Ilma will jump (or be pushed). It could be argued that Endless Blue Sky, while ostensibly revolving around Ilma, is actually more the story of the women who desire him. Each of them is presented with an obstacle to overcome, and if Nadia’s is resolved fairly simply, with much of her hardship occurring off-stage before the start of the book, the other two women spend much of the novel working their way through their issues. Miryeo’s sudden longing for her former lover only happens after her marriage falls apart, and Lee skilfully shows how the pair had drifted apart long before this (with gisaeng and failure in business acting as catalysts for the final break-up). Meanwhile, Danyeong’s pursuit of Ilma has more to do with her growing disillusionment with her acting career than any real attachment. When seen in this light, the growing friendship between the rivals towards the end of the story isn’t quite as surprising as it might appear. While Ilma and Nadia glide safely through the city’s dangers, others are not so lucky. Young dancers become addicted to the drugs on offer (supplied by Korean pharmacists…), and gangs kidnap wealthy locals knowing that the law is unable to touch them. It’s a beautiful place for people in love, and Ilma and Nadia wander around in the sunshine, enjoying a day out in the countryside surrounding the city. For the beggars on the streets, it’s a very different story. Endless Blue Sky is an enjoyable read providing a window onto an area not frequently covered in fiction. Capener’s translation brings across the period setting, and his brief introduction provides insights into the writer’s style and brief career (Lee died at the age of thirty-six in 1942, the year after this novel was completed). However, at times it can be a little stilted, with a rather literal approach to the text. Much of this will be due to the nature of the original, and I suspect that Capener will have been tempted on occasion to extend his scope from translator to editor. It’s not really something I recommend, but a little judicious cutting here and there by the original editors would have gone a long way. Of course, we mustn’t neglect the new stuff either, but quality translations of the classics can’t hurt. I, for one, am looking forward to seeing more in the future. So the LTI Korea will start doing more translations from now? There’s a tonne of new books comig out – started with the Good Son. How u keep up with the updates?